The Farne Islands lie between two and three miles off the Northumberland Coast between Seahouses and Bamburgh. As well as being the most famous Sea Bird Sanctuary in the British Isles they also have a large colony of Atlantic or Grey Seals. Birds that use these islands for nesting include Puffins and several breeds of Terns. There are some 100,000 pairs of breeding birds in the height of the season and they are remarkably tolerant to visitors, almost ignoring their presence for the most part. This allows you to get close up to these wonderful creatures and the photo opportunities are endless. There are between 15 and 28 Islands here depending on the tide at the time of your visit. The islands are owned and protected by the National Trust and are roughly divided into two groups, the Inner Farnes and the Outer Farnes. The Inner Farne has a religious history, from the year 678AD it was the home of St Cuthbert, he retired to the Inner Farne after 12 years of being Prior at Lindisfarne Priory on nearby Holy Island. He eventually died here in 687AD and there is still a church that was constructed in his memory in 1370AD. St Cuthbert is also said to be the first person to protect birds, even allowing Eider Ducks to nest on the steps of his alter! It is also home to 1,000's of nesting birds in summer including the stunning Puffin, Shags and four type of Tern. Breeding is at it's peak from May until the end of July but it is still worth visiting the Inner Farne outside of the breeding times. Other buildings of interest include St Cuthbert's Chapel and the medieval Pele Tower that is now home to National Trust staff who man and look after the Island and its wildlife for nine months of the year. Please note there are public toilets available on Inner Farne, but there are no public toilets on any of the other islands. Staple Island is a Bird Sanctuary and can be visited in the breeding season between the beginning of May and the end of July. The Islands is exposed and rocky, which makes it not ideal for visitors with limited mobility, but perfect for nesting birds including the Guillemot, Kittewake and Razorbill. This is probably the best of all the islands to visit if your primary reason for the trip is ornithology. 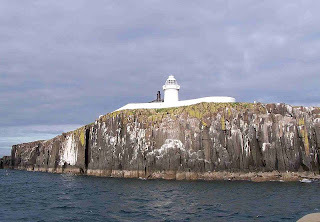 Longstone Island is most famous for it's lighthouse and for the legendary tale of Grace Darling. Built in 1825 the lighthouse was made famous by Grace and her Father William, who in 1838 rescued 9 survivors from the steam ship Forfarshire that had grounded on rocks at Big Harcar in stormy seas. They looked after them inside the Lighthouse for two days until the viscous storm died down. There is now a Museum dedicated to the story of Grace Darling in the nearby Village of Bamburgh. The lighthouse was manned until as recently as 1990 and is open to the public between April and October where visitors can see Grace's tiny bedroom from where she saw the sailors clinging to the rocks. The Outer Farnes are less 'populated' and are home to between 3,000 and 4,000 of Atlantic Grey Seals. It is the second largest sea colony in the UK and there are around 1,000 seal pups born in late Autumn each year. They can often be seen 'sunbathing' on the slopes of the volcanic rock that runs through most of the Outer Farne Islands. Your insider tip: National Trust members land free on the Inner Farne and Staple Island.... become a Member before you visit. For non-members there is a charge to land on these islands payable to the warden on arrival. There is not fee to land on Longstone Island for anyone. Getting to the Farne Islands is part of the fun of visiting, they are only accessible by boat and when the weather permits. There are several companies that are licensed to run boat trips to the Farne Islands and it takes around thirty minutes to get to the nearest of the Islands from the protection of Seahouses Harbour. See our parking and public transport information for Seahouses here. The first company is 'Glad Tidings' Boats. Run by Billy Sheil MBE, this family run business has been operating out of Seahouses for over 60 years. The family started taking boats to the Farnes in 1918, mainly fishing for lobster and crab, but taking the occasional keen ornotholgist with them to view the bird life on the island. Billy Sheil MBE, the third generation of the family now runs a fleet of seven passenger boats with his son William. The boats are all named Glad Tiding (numbered 1-7) and the boats have had the likes of Queen Elizabeth the second and the Queen Mother as passengers to the Farnes over the years. They are licensed to land on bird sanctuaries of the Inner Farne, the largest of the Farne Islands and home to many thousands of nesting sea birds. More information about Glad Tidings boat trips, including various itineraries, can be found on their website. The second company that offers trips to the Farnes is Golden Gate. They also offer various tours of the Islands and is the only way that you can gain access to Longstone Lighthouse. If this is high on your priority list for your visit to the Farnes then you should sail with Golden Gate. Visit their website for more information on the trips that they run.companies is St Cuthbert's Farne Island Boat Trips. They run two boats, both named after St Cuthbert who lived on the Inner Farne. They offer trips with landings on the Inner Farne, Staple Island and Longstone Island. Visit their website for more information, trip itineraries and pricing. 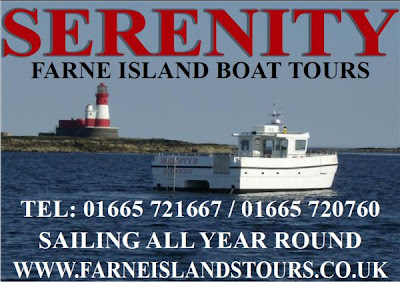 Another operator is Serenity Farne Island Boat Trip Tours offering some fantastic trips around the Farne Islands and Northumberland Coast. Serenity II is the first purpose build catamaran for the Farne Islands and with it's cutting edge design for enhanced stability giving the perfect platform for viewing the Farne Islands. If you love wildlife, photography, birding or just the boat trip then they are there to make your visit a memorable one. Hawk's Head Photography provide a range of specialist workshops for photographers. Their friendly workshop leaders are on hand to offer advice, practical tips and encouragement for all levels of ability – from complete beginners to advanced enthusiasts. 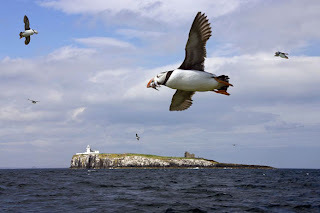 They organise a variety of trips to the Farne Islands throughout the year, visit their website for further information. In the Autumn and Winter Hawk's Head Photography also run workshops trips to the Farne Islands to see and photograph the seal colony. It's ideal for the wildlife photographer and the nature enthusiast, see more informaiton using this link. Sovereign Diving offer the total diving experience around the Farne Island and Northumberland Coastline, a small run family business which was established by our late father Ian Douglas. Our skippers have a wide knowledge of the dive sites and are able to provide the best possible diving to suit any level of diving experience. They also have a new catamaran which is very stable in the water. Both boats have tail lifts, toliets, storage, tea and coffee facilitites onboard, visit their website for more information. As with all boat trips to the Farnes, landing is entirely at the discretion of the boatmen and if they feel there is any risk due to swell or inclement weather they reserve the right not to land. All companies offer a complete commentary that covers the history of the Islands and the wildlife that you will discover on your trip.